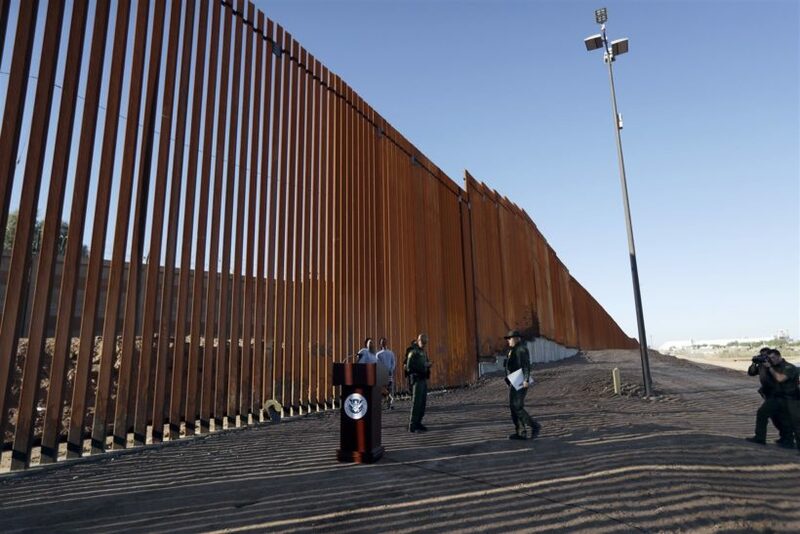 (by Anna Giaritelli, Washington Examiner) CALEXICO, Calif. — Homeland Security Secretary Kirstjen Nielsen on Friday unveiled the first completed border wall project that was constructed as a result of President Trump’s push to further secure the U.S.-Mexico border. Construction of the 30-foot, 2.5-mile-long wall began in February and lasted eight months. Nielsen watched as welders affixed a sign to the wall to commemorate the event. It’s now the tallest barrier on the entire 2,000-mile-long southwest border. 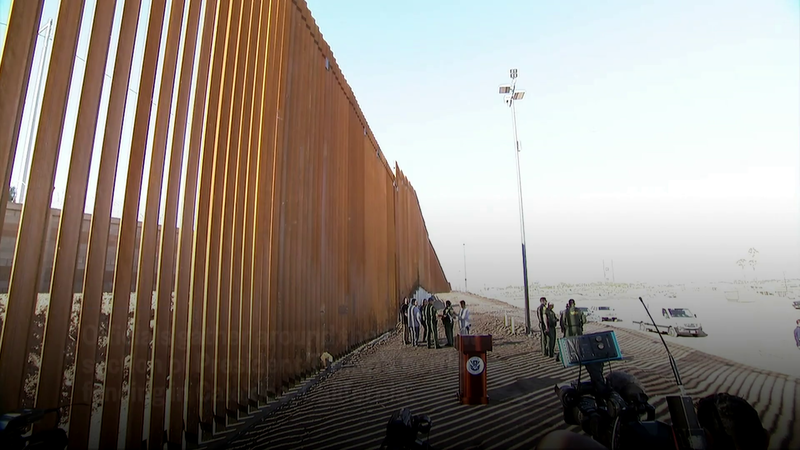 The wall replaced an older, shorter barrier that was installed in the 1990s and was comprised of recycled scraps of metal and old landing mats that could easily be climbed over without a ladder. The new wall is made of bollard fencing that consists of vertical steel posts that have been planted in the ground. The replacement project in Calexico was one of U.S. Border Patrol’s highest priorities because of the continued high level of illegal immigration and drug smuggling in the El Centro Sector. The project also includes about 2.5 miles of all-weather roads. These few miles of the El Centro Sector have seen the highest rates of apprehensions and drug smuggling in recent decades after its western neighbor, the San Diego Sector, enhanced its border security infrastructure. The move prompted smugglers to funnel traffic 90 miles east in the desert of southeastern California. People taken into custody in El Centro shot up from 28,000 in 1994 to 240,000 in 2000. “I’m confident that with this new 30-foot wall we can drive the number of apprehensions down ever further and chief was already telling me how it’s made a difference already in a few weeks,” Nielsan said, referring to El Centro Chief Patrol Agent Gloria Chavez. The Trump administration in late March announced plans to use $1.6 billion in new congressional funding for 100 miles of new and replacement border wall along the U.S.-Mexico boundary. Roughly 47 miles of current border wall is being replaced and the remaining 53 miles are new barriers. Twenty-five miles of new levee wall will be put up in Hidalgo County, Texas, and eight miles of new wall will be built in Starr County, Texas. Santa Teresa, N.M., will see 20 new miles of border wall. Construction in New Mexico is scheduled to start as early as next week. CBP announced in September plans to build eight border wall prototypes in San Diego. The prototypes underwent testing and evaluation through February. Vitiello said all of the designs will go toward the type of barriers that are built on the border. The kinds of wall used will depend on the needs of the officers who work in those regions. CBP wants an additional 1,000 miles of new fencing and said the $25 billion Trump requested in January would be enough to get all of it built. From WashingtonExaminer .com. Reprinted here for educational purposes only. May not be reproduced on other websites without permission from Washington Examiner. 2. How many miles long is the U.S.-Mexico border? 3. How high/long is the first completed project of President Trump’s promised border wall? 4. a) What type of wall does the new one replace? How does the new construction differ? Be specific. b) Explain why this replacement project was one of Border Patrol’s highest priorities. Be specific. 5. a) How many miles of new and replacement border wall will be built with the $1.6 billion Congress approved in March? b) How much money has President Trump asked Congress to approve for the entire wall? 6. In March, how did the acting deputy commissioner of CBP describe the wall system on the border? 7. President Trump has asked Congress to approve $25 billion in spending for the 1,000 miles of new fencing Border Patrol says is necessary to secure our borders. Consider the amount the government spends on a bridge or road built in your state. (For example, the cost to rebuild the Tappan Zee Bridge in New York was approximately $4 billion.) Democrats generally oppose constructing a wall on our southern border and therefore vote against this spending. Do you think Republicans in Congress should vote to approve this spending? Explain your answer. Read “Long-time Democrat and legal immigrant looks at open borders” and answer the questions.